A buddy of mine at seminary and I have been having semi regular bouts of walking and theologizing. We’ve been discussing belief a lot around here. Often this takes a very negative, if comical form. Someone calls someone else a “heretic” because they express doubt about the perpetual virginity of Mary, say, or wonder about the physical resurrection. Theological debate then begins around what constitutes true Christian faith. Do you have to believe in the virgin birth, or the physical resurrection? Is faith the denial of science for the sake of the miraculous? Does that take us all the way to denying evolution? In the midst of all of this I keep returning to questions of epistemology, the study of knowledge. Where does knowledge come from? What is true? What is belief? I think we’ve come to associate belief and truth with a scientific process of proving hypothesis in this period of human history. We tend to think that knowledge comes from gathering observable data and testing patterns in that data. Something is true if we can observe and measure it. For most of human history this wasn’t the way of thought. Applying the scientific method to stories in the Bible leads us to wonder if a cold front pushed back the Red Sea or if Lazarus was comatose. We tend to hypothesize about the miraculous. I think this involves importing a modern view of scientific truth onto a set of stories that weren’t meant to be tested as “data.” For earlier people, truth was narrative. People understood that story, poetic meaning, commitment embodied truth. We were defined through relationship. Truth wasn’t found by testing data, but by finding resonance in poetry, art, story. Understanding this definition of truth is important as we approach Christian belief. I’m not sure the creeds were set up to say “all the physical evidence to the contrary, I believe…” Believing in the Incarnation may have less to do with wondering how exactly it was that Mary came to be pregnant, and more to do with understanding that God sees humans as worthwhile enough to share life with. Whatever is scientifically probable, the deep truth being affirmed is that God loves us enough to dwell among us. However it is that Jesus is resurrected, the deep truth is that he overcame all barriers, even death, to show his redemptive and liberating love to the world. God is in very nature improbable. So what does believing in the resurrection look like? Is it a thought process denying the truth of science, or does it mean we hope against hope for new birth in the lives of the suffering around us? What does faith in the incarnation look like? Does it mean we assert that Mary was forever a virgin in our minds, or does it mean that we stand up to the powers of the world that tell us we are worthless because we trust in the God who chose us as neighbors? If we hold on to tightly to our beliefs, they become blunt instruments useful for bludgeoning and not much else. If we are able to hold them gently, we might just be surprised that resurrection, incarnation, and miracles, are not stories of old but living truths available in our world. Faith becomes playful rather than painful. What do you believe? How do you believe? 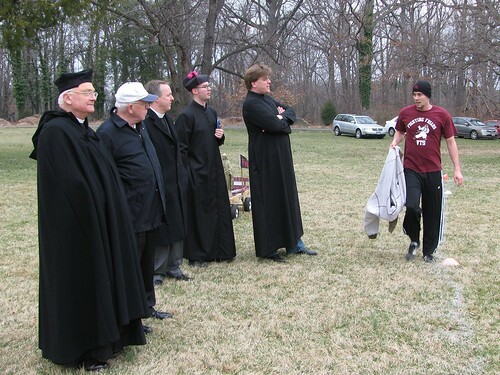 Playful faith...Seminarians dressed up to watch a VTS soccer game. I really enjoyed reading this. I am frequently amazed at your insight and wonder where on Earth it came from. I particularly enjoyed the idea of “…holding our belief gently….” There is much to that. Wow dude. I love this entry. As someone who has been bludgeoned more than once by belief, and had that awful experience just one week ago, I really appreciate what you wrote here. These questions were literally in my mind as I walked down the street this afternoon, and I’m pretty sure they will haunt me constantly as long as I live. It’s so hard for my logic-dependent brain to grasp many of the stories in the Word. Anyway. Thanks for the post brother. I am an Episcopal priest, and I serve with the people of The Church of the Holy Communion. My husband Ellis and I live in St. Louis with our labradoodle Oscar. I read, write, travel, play ultimate frisbee, and goof around with various acoustic instruments. Servant Leadership: What do you do when you discover you're the most powerful person in the room?